The 8th Annual Irish-American Crossroads Festival was a tremendous success as we hosted an unprecedented lineup of events over a 21-day period. We proudly hosted eleven remarkable events showcasing an astoundingly broad array of voices from literature, music, dance, theater, and spoken word. These voices ranged from internationally award-winning musicians to those of men and women from our own local communities! It featured Irish-American literature and oral history as our particular focus. In this unprecedented lineup of events, we highlighted oral history alongside the Irish-American literary tradition because we understand that the oral tradition is a foundation of Irish-American cultural expression. Through the events of this year’s Festival, we aimed to explore the unique arc of Irish-American literary history, and the link between the oral tradition and the written word. In addition, we were pleased to bring forward the voices of men and women who have participated in the newly launched Crossroads Irish Oral History Archive of the San Francisco Bay Area. Grammy nominated fiddler and composer, Liz Carroll, opened the Irish-American Crossroads Festival with a rare solo appearance. Liz, a well-respected composer celebrated for invigorating the traditional styles of Irish music, is the recipient of numerous awards, including an Irish Traditional Musician of the Year award and a National Heritage Award. Her most recent album, Double Play, was nominated for a Grammy in 2010. In addition to these accolades, Liz Carroll has won the TG4 “Traditional Composer of the Year Award” for 2011. She is the first Irish-American to receive this honor. Location: The Plough and the Stars Pub, 116 Clement Street @ 2nd Avenue, San Francisco. Patrick Ball, a premiere Celtic harp player and captivating storyteller in the Celtic tradition, told tales with a rhythmic charm that served up a feast for the mind of children. 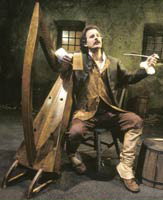 As an accompaniment to these tales, Patrick playted the Celtic harp and offered the children an introduction to this rare, legendary instrument, its music, its playing technique and its place in Irish culture and folklore. The Murphy Irish Dancers also performws jigs, reels, and other high-kicking dance steps! This gathering of leading voices in Irish-American literature will explored the enduring history and contemporary impact of Irish-American literature, including readings from their most recent works. Charles Fanning has written that an Irish-American voice can first be found in a broadside that appeared on the streets of New York in 1789. Wave upon wave of immigration from Ireland has continually influenced the literary voice of the Irish in America, always reflecting the energy of the newest arrivals as well as their efforts to adapt to this new land. Please join us for a lively conversation about the past and present importance of the Irish-American literary tradition. Charles Fanning, author of the Irish Voice in America: 250 Years of Irish-American Fiction and Mapping Norwood: An Irish-American Memoir. Kathleen Hill, author of the novels, Who Occupies This House and Still Waters in Niger. Caledonia Kearns, editor of Cabbage and Bones: An Anthology of Irish-American Women’s Fiction and Motherland: Writings by Irish-American Women about Mothers and Daughters. The Irish-American Crossroads Festival gratefully acknowledges the generous underwriting sponsorship for events at the Main Public Library by Ranger Pipelines, Inc. of San Francisco. Grammy nominated fiddler and composer, Liz Carroll, joined in concert with Jake Charron, one of Canada’s finest accompanists for fiddle music. In his West Coast premiere, Julian Gough, born in London, raised in Ireland, and living in Berlin, read from his most recent book, Jude: Level 1 (2008), part of a hugely ambitious attempt to write the funniest serious novel of the new millennium. This reading will also explore how the arrival of a multicultural perspective in Ireland and Europe resembles the American experience. We invited discussion as to how this recognition affects the definition of Irish-American experience. This event was moderated by the celebrated author, Yiyun Li, whose works of fiction have garnered such prizes as the Frank O’Connor International Short Story Award and the PEN/Hemingway Award, among many others. She was also named a MacArthur Foundation fellow in 2010. Crossroads 2011 was proud to host this event, which was supported by Imagine Ireland, an initiative of Culture Ireland, and by A Public Space, an independent magazine giving voice to the twenty-first century. Audiences enjoyed the afternoon as we honored and celebrated the voices and contributions of the 1950s generation of Irish immigrants to the San Francisco Bay Area. In this event, individuals from the Crossroads Irish Oral History Archive of the San Francisco Bay Area told their stories, in their own words. 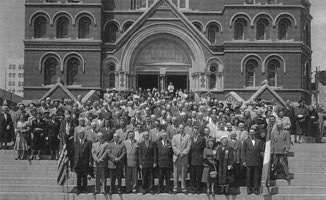 To learn more about the Oral History Archive Project, please go to: San Francisco Irish Oral History Archive Project. Irish-American Crossroads 2011 was proud to present the winners of the First Annual Irish-American Writing Contest in Memoir. 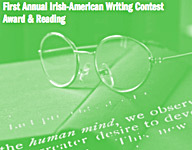 The aim of this contest was to support and develop the voices of Irish-American writing. This event celebrated the winners of the Memoir contest and provided an “open mic” opportunity for writers in the community to read from their memoirs (time limited, five minutes per person) about the meaning of an Irish-American heritage. Michael Patrick MacDonald, author, All Souls: A family Story From Southie and Easter Rising: A Memoir of Roots and Rebellion. Patricia Monaghan, author, Red-Haired Girl From The Bog: The Landscape of Celtic Myth and Spirit. James Silas Rogers, editor, New Hibernia Review: A Quarterly Record of Irish Studies. Poetry Reading and St. Patrick’s Day Celebration! Audiences enjoyed a night of poetry and Irish hospitality to celebrate St. Patrick’s Day! Crossroads 2011 was proud to host a reading of some of the Bay Area’s finest poets. Gillian Conoley is a Pushcart Prize-winning poet and the Poet-in-Residence and Associate Professor at Sonoma State University. Conoley is the author of four poetry collections, including the highly praised Some Gangster Pain and Tall Strange. Kathleen Lynch’s collection Hinge (2006) won the Black Zinnias Press National Poetry Book Competition. Her numerous award-winning chapbooks include Alterations of Rising and Kathleen Lynch – Greatest Hits. Her work (fiction and poetry) appears in several anthologies, including The Next River Over— A Collection of Irish American Writing (New Rivers Press). Gwynn O’Gara is Sonoma County’s sixth poet laureate (2010 – 2011) and is a teacher for California Poets in the Schools. She is the author of three chapbooks of poetry, Winter at Green Haven, Fixer Upper, and Snake Woman Poems. Gwynn is a lifetime poet. Irish Labor History in San Francisco: A Walking Tour along the Waterfront. An intrepid group joined veteran City Guide tour guide, Peter O’Driscoll, along with historian and author, Lawrence H. Shoup, for a fascinating tour illuminating the history of San Francisco’s famed waterfront, with a particular focus on its Irish and Irish-American workers, leaders, and martyrs. The tour included the sculpture dedicated to the waterfront strikers of 1934 and other historic markers along the way. The tour ended inside Rincon Center discussing the historic murals dedicated to the labor movement in San Francisco. 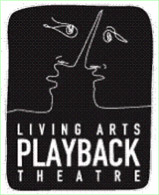 Irish-American Crossroads 2011 was pleased to introduce The Living Arts Playback Theatre Ensemble to Festival audiences. Believing that moments of our lives can be touchstones, full of power and significance, The Living Arts Playback Theatre transforms personal stories told by audience members into theatre pieces using movement, ritual, music, and spoken improvisation. We invited the audience members to share their stories of Irish-American heritage at this event, which were then transformed into theater by this remarkable ensemble. Irish-American Crossroads extended a special invitation to those who emigrated from Ireland to the San Francisco Bay Area as part of the 1950’s generation, and their Irish-American counterparts to share their stories at this event. This event was open to the public. Special thanks for support from the Irish Government’s Emigrant Support Programme (ESP).